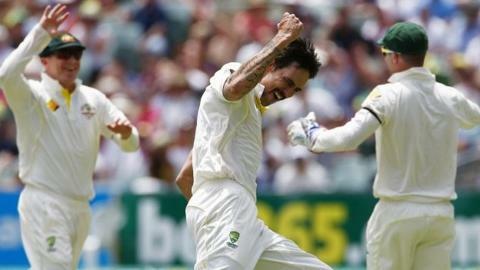 England are teetering on the brink of a second humiliating defeat in two Tests after fast bowler Mitchell Johnson rampaged through their out-of-form batting once again. "England can't win the Ashes, they are not playing well enough. History says you don't come from 2-0 down. There has to be some straight-talking. "Bell must bat at three and someone needs to talk to Pietersen. He can't keep giving it away. Cook needs to get forward more and I don't think Stokes is good enough yet. Root needs to stop making mistakes, because what he did last year doesn't count. "I'd play Monty instead of Swann. He doesn't seem to know what field to set. He's been a great performer, but we can't be sentimental. "Matt Prior can't carry on this way, especially if he doesn't get any runs in the second innings. At the moment, we're in a state of flux, we're past our best." Johnson took 7-40, including a wonderful spell of 5-16 in five overs after lunch, as England were rattled out for a feeble 172 to concede a first-innings deficit of 398 runs. Only Ian Bell, with an unbeaten 72, and Michael Carberry (60) offered any resistance as their team-mates either tossed their wickets away or were simply unable to cope with Johnson's fearsome pace. Twice the left-armer was on hat-tricks after both Stuart Broad and James Anderson were bowled first ball, while Matt Prior's dismal run of form continued with his fifth duck in nine Tests. With time on their side, Australia then opted to bat again, and had extended their lead to 530 with seven wickets still in hand by the close. But with two full days to come, England need a miracle in the city of churches to prevent themselves going 2-0 down in this Ashes series. So abject was this display, and so one-sided has been the series thus far, that Australia are now unarguable favourites to win back the urn for the first time since 2009. Needing 371 to avoid the follow-on after Australia's runaway 570-9 declared, England had begun with determination and discipline, only for all that to rapidly evaporate into the warm south Australian air in the hour before lunch. Joe Root set the tone, slog-sweeping the first ball he faced from Nathan Lyon to Chris Rogers at deep square leg to throw away his wicket for 15 after 79 previously patient deliveries. If that was wasteful, Kevin Pietersen - scorer of 158 and 227 in his previous two Tests on this ground - was then guilty of a crass misjudgement when, with two men in catching on the leg side, he attempted to flick Peter Siddle over them and instead picked out George Bailey at mid-wicket for just four. Carberry and Bell briefly arrested the descent, Carberry going to his maiden Test half century, before David Warner clung on to a diving one-handed catch at mid-wicket to see off the opener. But the real horror began after lunch, when Johnson tore in from the Cathedral End like some fast-bowling banshee to blow the England middle order away. In the space of one extraordinary over he had debutant Ben Stokes trapped lbw on review for one, Prior caught behind after being roughed up with two short ones and Broad bowled behind his legs the very next ball. Graeme Swann survived the hat-trick ball at the start of Johnson's next over but then swiped at a wide one to be brilliantly caught by Michael Clarke at second slip for seven. Next into the mincing machine was Anderson, bowled for a golden duck and given a fierce send-off by the close fielders as he departed, head bowed. In five and a half overs Johnson had taken six wickets, England losing six for 24 either side of lunch. Alone amid the wreckage stood Bell, who went on the attack with only Monty Panesar for company and raced past his half century as Johnson was rested. But when the fast bowler was recalled to the attack, he bowled the brave Panesar to leave England adrift in a sea of scorn. As Australia looked for quick runs, Anderson had Rogers caught behind for two and Shane Watson taken in the gully for a duck before Panesar bowled Clarke with a beauty that drifted and turned. But the pugnacious Warner (83 not out) and Steve Smith (23 not out) saw them to the close at 132-3 to leave their side in total control. Listen to Jonathan Agnew and Geoff Boycott's review of the day on the TMS podcast page. Catch up with a two-minute summary of Test Match Special commentary with Pint-sized Ashes. To catch up with the action from day three, check out this gallery on the BBC Sport Facebook page.